Green Bay, WI – Dr. Brusky uses three primary dental treatments to prevent and treat cavities: dental fillings, Preventive Resin Restoration (PRR), and sealants. You’ve probably heard of dental fillings and sealants; PRR, not so much. Dr. Brusky believes that patient education is key to excellent dental treatment, and he feels it’s important that you know the difference between all three dental procedures. Dental sealants are plastic coatings professionally placed on the occlusal or chewing surface of your permanent back teeth in order to prevent tooth decay. This treatment typically only takes a few minutes per tooth. Since premolar and molar teeth have grooves in their surfaces called pits and fissures, they are especially vulnerable to decay. These fissures can be deep and narrow, making them very difficult to access and clean. Sometimes these fissures are smaller than even a single toothbrush bristle. Plaque then begins to gather in these areas, and the bacteria in the plaque attacks the tooth’s enamel. Over time, cavities can develop. In fact, over 75% of tooth decay begins in these fissures. While fluoride helps prevent decay, dental sealants provide extra protection for these areas by creating a smooth surface over the fissured area. 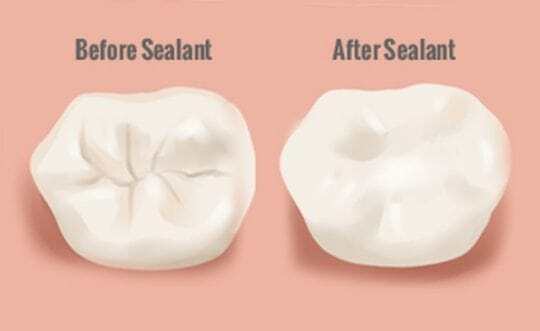 It is important to understand that sealants are not meant to last forever, they will eventually fail. Over time, gradually, and virtually undetected, the sealants start to wear down. During this process, little pockets or holes appear which is the perfect hiding place for bacteria. While sealants can protect teeth for many years, they need to be checked for wear and chipping. By using special magnification at our dental facility, Dr. Brusky is able to identify the dark shadow that appears under deteriorating sealants that normally goes unnoticed. If left untreated, the tooth is at risk for the decay getting even larger, eventually creating a pulp exposure and the need for otherwise preventable but more extensive dental treatment. Sealants are usually applied on children’s teeth in order to protect their molars against the development of decay. In some kids, it is prudent to even put them on baby teeth if they don’t have good oral hygiene, there is a history of decay/fillings on the primary teeth, or the baby teeth have deep grooves. If the tooth has already experienced decay, a filling may be necessary to repair the damage and to provide strength for the tooth. Fillings help restore damaged teeth to their normal function, appearance, and shape by filling in cavities caused by tooth decay, erosion, and/or fracture. PRR uses the same tooth-colored composite material as fillings, but there is one very big distinction between the two. While a filling often extends into the dentin of the tooth, PRR does not. Like sealants, PRR is a preventive measure to protect teeth from decay. The difference between sealants and PRR is that sealants may only last 6 to 8 years, while PRR can last indefinitely, just like a filling. Another distinction is that hygienists can place sealants while only a dentist can place PRR or fillings, as a drill is used in both procedures to remove decay. In the PRR, the decay is only in the enamel and therefore anesthetic is not needed to remove it. Dr. Brusky only uses composite resins which are matched to your teeth to create a natural look. Because of this, tooth-colored fillings are often used on the patient’s front teeth. After applying adhesive, the ingredients are placed directly into the tooth’s cavity, where the mixture will harden. However, with very large fillings, composites may not be the optimum material since they could chip or wear over time. 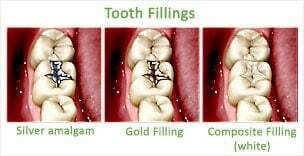 Dental amalgam, or silver filling, is an inexpensive and unyielding material commonly used for filling cavities. The metal alloy is comprised of mercury, silver, and tin, with small amounts of copper and zinc. Dr. Brusky does not use this material due to concerns about toxicity, inferior physical properties, as well as the substance’s inability to bond adequately to the remaining tooth structure. Therefore, amalgam does not enhance the strength of a tooth a great deal, and stress cracks tend to be very common in metal-filled teeth. These cracks ultimately lead to more fractures of entire sections of the tooth, weakening it even further and allowing bacteria to enter en masse. The other concern is that metal filling expands and contracts at a rate greater than the natural tooth when exposed to extreme temperatures, thus causing cracks in the tooth structure over time. To learn more about tooth-colored fillings, dental sealants or PRR, call the dental professional, Dr. David Brusky today. Also, especially if the patient has a high CRA, why would you not consider amalgam?